Organic Cotton Canvas Tote - designed to fit the BackJack Folding chair! Organic Tote Bag by BJ Industries. 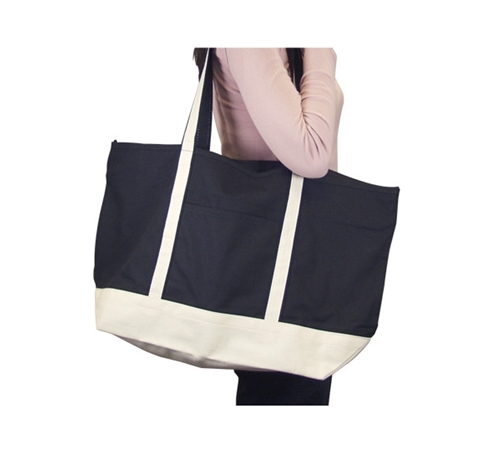 Sturdy and long-wearing 100% organic cotton canvas tote bag. This USA made tote will accomodate the BackJack Folding Chair, or just about anything else from books to groceries. Choose from Natural with Black trim, or Black with Natural trim. Choose color from drop down menu. Size: 14"H x 22"W x 7"
Visit our sister company Home Theater Express for popcorn machines, popcorn supplies, & other concession equipment to make your home theater more like a cinema today!